Gran Canaria Weather in January & What Temperatures To Expect? Gran Canaria is a popular destination in January, as it is one of the warmest places in Europe for winter sun, along with the other Canary Islands in the archipelago. Actually, we prefer Gran Canaria and Tenerife during the winter season, especially the southern regions, where it's also the sunniest and driest part of each island. Since the weather is warm and pleasant in Gran Canaria in January, the island gets busy at this time of year with tourists who come here to escape the hard winter back home. High demand also means higher prices, so make sure to book your flights and hotels well in advance if you want to get a good deal. The prices tend to go skyrocket around the holidays, so after Christmas and New Year's are gone, you might have a chance to get a nice deal for January. The temperatures during the day in January are between 20°C and 23°C, which means that when the sun is out you can sunbathe comfortably and work on your tan. With an average high temperature of 21°C and an average low of 15°C, during the daytime, you will be fine wearing just T-shirts and shorts, but at night, you will need to wear at least a cardigan or a jacket, as it can be quite nippy. There are around 3 to 4 windy days in January (where the wind speed surpasses 55 km/h), which is 5 to 6 times less than during the summer months, when the wind is almost constant. With an average UV index of 4 throughout the month, January has the lowest readings of the year for this index (equal to December), which means that a sun lotion with medium protection will be enough to keep your skin protected from the sun. The great thing about Gran Canaria is that here the weather is nice and warm all year round, meaning that even in January, the weather in Gran Canaria resembles the summer some of the Nordic countries in Europe get. But if you're looking for really hot weather, January might not be the best time to come over and you'd better wait until July and August, when the temperatures really go into summer mode. The average high temperature in January in Gran Canaria is around 21°C, while at night you can expect temperatures of around 15-16°C. The highest temperature ever recorded in Gran Canaria in January (at Airport station) was of 29.5°C and the lowest was of 8°C. January is the second rainiest month of the year, after December. You can expect around 25 mm rainfall over the course of 3 days in January, but some areas are drier than other, so when it rains it doesn't happen at the same time all over the island. Of course, the south of the island, especially the area around Puerto de Mogan, sees a lot less rain than the mountainous regions. Gran Canaria gets an average of 6 hours of sunshine per day in January, which means that you will also get some cloudy and overcast days throughout the month, since this is a typical feature of the weather in Gran Canaria during the winter months. The average surface sea temperature in January at the Gran Canaria Airport station is approximately 20°C and it starts to drop while the month progresses towards February. Can you swim in Gran Canaria in January? With an average temperature of 20°C, the ocean is too cold for swimming comfortably in January for most people. But especially in the south, in resorts like Puerto Rico, Arguineguin, Playa Amadores or Anfi Beach, you'll still see children playing in the sea and on some beaches people swimming, but it depends on how each person tolerates lower sea temperatures. We usually recommend that you book a place with a heated pool during the winter season if you wish to swim during your holiday. January is a good month to combine some days of lounging in the sun with days of exploration, in order to make the most of your time here even when the weather might not be so great. Don't be discouraged or disappointed if you get a cloudy or rainy day, since at this time of year it's winter even here in the Canaries. It's better to just hire a car and drive around the island, since there are high chances that you will find some place where it's sunny or where at least it's not raining, which is still a big plus. 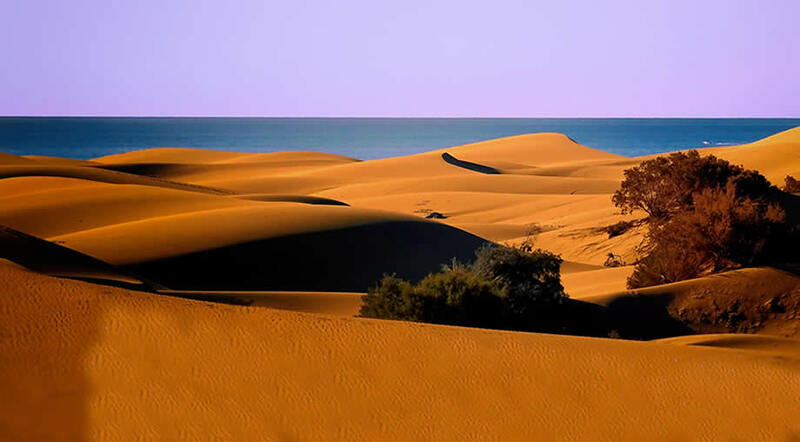 The dunes of Maspalomas should be on your list of things to see no matter during which season you come for a visit. On a sunny day, you can walk on the dunes and take some really amazing photographs (it's probably one of the most Instagrammed places in Gran Canaria). Then head over to the beach and if you don't want to sunbathe you can just walk along the ocean, since you have several miles of beach to explore. This is a great option for a cloudy or rainy day. Head over to the capital and visit this large aquarium that fascinates kids and adults alike. You can learn more about the marine life endemic to the Canary Islands and see some of the species that swim in these waters. On the 5th of January 2020, the entire island of Gran Canaria will celebrate the visit of the three wise men: Balthasar of Arabia, Melchior of Persia and Gaspar of India. This is a big holiday in Spain and there's a big parade organized in several towns around the island.